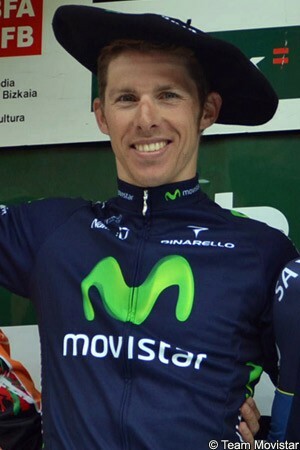 Rui Costa (Movistar) moved a little closer to a successful defence of his Tour de Suisse title as he took the Queen stage of the race, between Meilen and La Punt. The Portuguese rider was the fastest of a three-rider group that had escaped on the final, hors category climb of the Albulapass, and the fast, hairpin descent that followed. Despite leading throughout the 9.3km descent, including the flatter finishing straight, Costa managed to hold off both Bauke Mollema (Blanco) and Tejay van Garderen (BMC Racing) in the sprint for the line. Thibaut Pinot (FDJ), who had been part of the leading group over the Albulapass but dropped on the descent, took fourth place, nine seconds behind the stage winner. With the leaders having been held up by the collapsed inflatable banner marking the final two kilometres, Cameron Meyer (Orica-GreenEdge) won the sprint for fifth place at the head of a group containing yellow jersey Mathias Frank (BMC Racing) just 22 seconds behind. Starting the day 35 seconds ahead of Costa, Frank’s overall lead was reduced to just 13 seconds, but the Swiss rider held on to his yellow jersey for another day. "Our goal today was taking some seconds on the riders ahead of us in the overall and we didn't only do it, but we also won the stage, and I'm super happy,” said Costa afterwards. “It was a pity to lose time with the banner thing. I think we might have lost 10 seconds there and they might become decisive for the overall, but the important thing is that I saw myself strong in view of Sunday's TT. I had really good legs all over the climb. When the Saxo Bank riders were pushing, I realised [Roman] Kreuziger asked [Nicolas] Roche not to push so strongly. That's why I knew I had to go full gas as soon as Mollema jumped, because we had to take time for the overall. “I wasn't really thinking of the stage win, but at the end of the descent, there were 500 metres of flat and a couple of turns that allowed me breathing a bit before the sprint,” Costa added. “We'll try to spend tomorrow's stage as easy as possible and give it all on Sunday. It's not only Frank and Kreuziger, but also Mollema, Pinot or even van Garderen. I know the time trial's route and it's a really hard one. The wind might be crucial into the first 15 kilometres, because there's almost no protection and, should it blow like today, it will be a head one. It's going to be really demanding. “This victory is for all my team-mates, because they did an excellent work not only today, but also during all the race," Costa added. The mountainous 206km stage began with several unsuccessful attacks, until a 14-rider group managed to escape after 68km. In the group were José Joaquin Rojas (Movistar), Eduard Vorganov (Katusha), Andreas Klöden (RadioShack-Leopard), Niki Terpstra (Omega Pharma-Quick Step), Manuele Mori (Lampre-Merida), Damiano Caruso (Cannondale), Michael Mörkov (Saxo-Tinkoff), Daryl Impey (Orica-GreenEdge), Adrian Saez (Euskaltel-Euskadi), Tomasz Marczynski (Vacansoleil-DCM), Johannes Fröhlinger and Georg Preidler (Argos-Shimano), Jean-Marc Marino (Sojasun) and Luis León Sánchez (Blanco). The break’s lead reached its maximum of 5’25” over the top of the 1st category Wolfgangpass with 85km to go, but steadily came down on the approach to the final climb to the Albulapass. With 25km to go Sánchez and Preidler left the rest of the group behind, just as Joe Dombrowski (Team Sky) attacked from the peloton. The American rider soon caught and left the two riders behind, and set off alone. Saxo-Tinkoff was steadily reeling Dombrowski in but, with four kilometres to climb, Mollema attacked, taking Pinot, Costa and van Garderen up to the Team Sky rider. Dan Martin (Garmin-Sharp) managed to join the group, but was dropped with Dombrowski as Pino accelerated close to the summit. Behind the lead group, Frank was struggling to follow, but found company with Meyer, Roman Kreuziger (Saxo-Tinkoff) and Simon Spilak (Katusha Team). The four-man group was just 30 seconds behind the leaders over the top of the climb and, having caught Martin and Dombrowski on the descent, had cut this deficit to just 22 seconds by the finish. Several groups tried to escape in the first hours of the race, but it was not until the 68km point that the 14 riders finally got away. Sánchez was the best overall, 6’27” behind Frank in 29th place, but BMC Racing was happy to let the group build its 5’25” lead through the midway point of the stage, but it was down to 2’45” as the race entered the final 70km. With 30km to go the gap was down to just 1’22” and, as the Albulapass began with around 25km left Sánchez attacked the break, with only Preidler able to follow. Simultaneously Dombrowski attacked from the peloton behind, as Saxo-Tinkoff leading the chase onto the climb. BMC Racing was positioned behind the Danish team, but Frank was beginning to look uncomfortable. With 22km Dombrowski, Vorganov, Caruso and Klöden were 30 seconds behind Sánchez and Preidler; the peloton was at 1’06” as it swept up the stragglers from the breakaway group. Saxo-Tinkoff was continuing its pace at the head of the field and, with 20km to go, the gap dropped below a minute. Dombrowski had left the small chase group behind by this point, and rode across to Sánchez and Preidler. The American immediately took the lead, dropping Sánchez, and Preidler too was left behind shortly afterwards. Simone Stortoni pulled Lampre-Merida team captain Michele Scarponi clear of the front of the peloton, and the two of them quickly established a gap as they swept past Klöden and Vorganov. They soon caught up with Sánchez, but the splintering field was not far behind. As Sánchez was caught by the peloton, he set to work at the head of his Blanco teammates and began to lift the pace, pulling the group past Stortoni who had let Scarponi go. The pace shelled further riders out of the back of the group, but Frank was still there close to the front. Saxo-Tinkoff took over with 16km to go, steadily reeling in Scarponi, and cutting Dombrowski’s lead to 35 seconds. Dombrowski was now holding his own over the chasing group, however, and was maintaining his 35 second lead, while Scarponi was 23 seconds behind the American with 14km to go. With 13km to go Mollema attacked, and Pinot followed, and the two of them quickly passed Scarponi. Van Garderen also followed, with Costa on his wheel, while Andy Schleck (RadioShack-Leopard) was chasing with Frank following close behind with Martin and Meyer. Having put in so much work, Saxo-Tinkoff’s Roche and Kreuziger were left behind. Martin jumped away from the group, just as Schleck was dropped, leaving Frank and Meyer to chase by themselves. Costa, Pinot, Mollema and van Garderen had Dombrowski in sight, and they caught up with the American rider with just under 11km to go. Martin joined the group shortly afterwards, taking its number up to six, but it was only 11 seconds ahead of Meyer and Frank with little more than a kilometre to climb. Pinot tried to escape the group, which saw Dombrowski and Martin were left behind. As the FDJ rider led over the top of the climb with 9.3km to go, the two riders were 12 seconds behind the leading four, with the group of Kreuziger, Frank, Spilak and Meyer at 30 seconds. Van Garderen was allowing the other three riders to set the pace on the descent, with his teammate trying to close the gap behind. The Swiss rider soon closed the gap to Dombrowski and Martin, and was just 20 seconds behind with four kilometres to go. Up ahead, the pace set by Costa on the hairpin descent was gapping Pinot and Mollema, but . Both leaders were brought to a sudden halt with two kilometres to go, however, as the inflatable banner had collapsed onto the road. They were soon moving again, but Mollema - who was about to regain contact - was delayed and lost ground again. Race officials managed to lift the banner high enough for the rest to pass under, and the gap to the chase group had closed a little. Mollema caught up with the two leaders as the final kilometre levelled out, with Costa leading into the finishing straight. Despite van Garderen and Mollema closing in either side of the Portuguese rider, he managed to hold them off to take a close sprint. Pinot crossed the line in fourth place, nine seconds back, while the Frank group came in after 22 seconds, with his yellow jersey just intact.